Kasey Kahne #5 Great Clips Throwback Chevy SS-The All-Star Racing in yellow and white looks really good, and the design works very well. It’s an A scheme for sure. Reed Sorenson #15 Corrigan Oil Chevy SS-The red and black stripes are a bold look, the car looks good, and has a great color scheme. 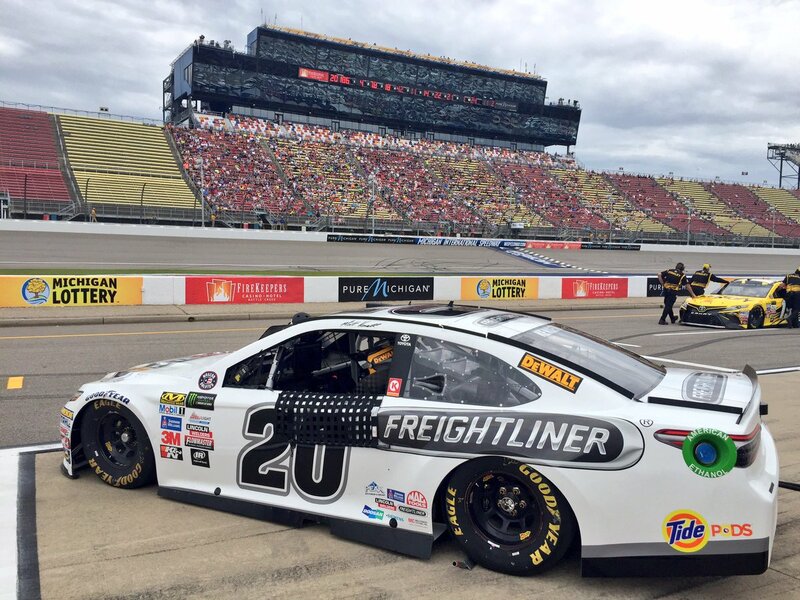 I give it an A.
Matt Kenseth #20 Freightliner Toyota Camry-Solid white works well as a background color, and the design is great. Definitely worth an A.
Ryan Blaney #21 OmniCraft Auto Parts Ford Fusion-While the car does look good, the orange looks out of place. The red works much better. Still, it’s a good scheme, and worth an A-. Ryan Newman #31 Velveeta Shells and Cheese Chevy SS-Going to do some revisionist stuff here. When I first graded this scheme, I blasted it because in the photo that I used, the car looked beige. Between then and now, the yellow was brightened, and the car looks better as a result. This change took the car from a C+ to an A.
Kyle Larson #42 Target/Cars 3 Chevy SS-I like the idea here, but it’s not well executed. The tearing of the Target scheme into a Cars 3 motif looks forced. One or the other would work. It’s not terrible, but it needs work, so I’ll give it a B+. Dale Earnhardt Jr. #88 Mountain Dew Chevy SS-Metallic green is a great color to use on race cars, and the designs work well with the color scheme. It’s a great scheme, and I give it an A.